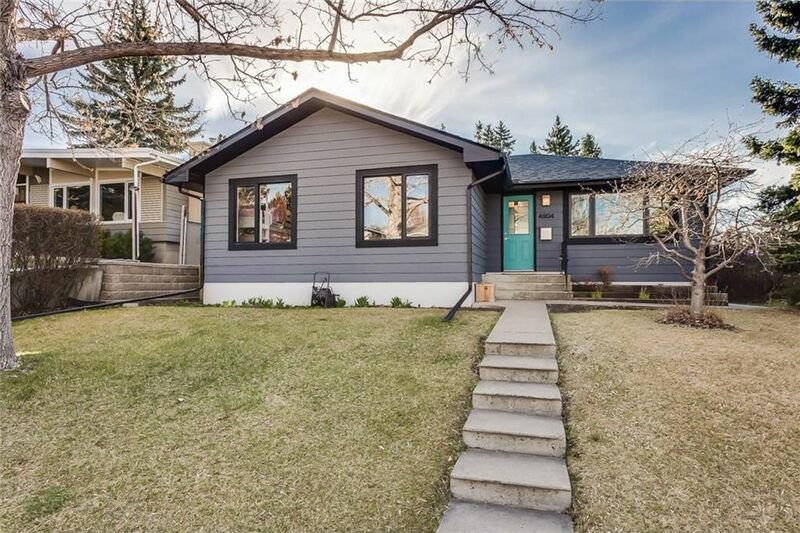 Gorgeous Modern Bungalow located on a quiet & beautiful tree-lined street has everything you're looking for! Pro Renovation. The main floor features a HUGE Master w/vaulted ceiling, Lg linear closets & full En-suite, 2 kids bdrms with brand new 5-pc bath, main floor office (could also be a bdrm), open concept LR/DR/Kit & mudroom. The kitchen boasts quartz counters & island with breakfast bar, dark cabinets, walk-in pantry, appliance garage & high-end SS appliances & wine fridge. Site-finished oak hardwood throughout, kitchen & baths all have porcelain heated tile floors. Updated windows with custom blinds. The basement is fully finished with lg Rec Room, bedroom, full bath & laundry. HE Furnace, Rinnai HW, Nest Thermostat, newer Roof, updated electrical & plumbing. The large windows & skylight offer excellent natural light flow. Lots of built-in storage. 20'x22' finished garage. Walking distance to Nose Hill, LRT, Triwood Rec, all levels of schools & shopping.